Has it been far too long since you last gorged on fried Oreos while watching monster truck shows? Yeah, we thought so. Fortunately, fair season is coming up! You won't want to miss out on that aforementioned monster truck show, plus demolition derby, a So You Think You Can Dance show, and plenty of rides, food and crafts. Admission for adults and children 12+ is $10; kids 11 and under are free. Buy tickets online here. In addition to all that county fair goodness, a beautiful baby contest, southern mix chorus, dance performances and a balloon man are the main draws here. Tickets for those 12+ are $6; kids 6-11 are $5, and kids younger than 5 can enter free. Head out to see an "Arundel Idol" competition and enjoy food, crafts and carnival rides. General admission is $6 for those 16 and over; $4 for kids 8-15 and free for kids younger than 7. Enjoy games, pony rides, lawn mower races, craft displays, and four stages filled with music and other performances. Admission is $5 for ages 11+ and free for kids 10 and younger. Season passes are available for $12. Go for carnival rides, animal exhibits, craft displays and two very important words: demolition derby. General admission $10; $5 for ages 6-12; free for military personell and children under 6. Youth 15 years and younger are free July 31 until 4p.m. ; Seniors 62 and older are free August 1 until 4 p.m.
Not only is this fair free, it's Metro-accessible. Check out the scavenger hunt, racing piglets, pony rides, face painting and of course, the carnival rides. A shuttle bus is available for $2 from the Ballston Metro station and other locations; parking at the fair is prohibited. 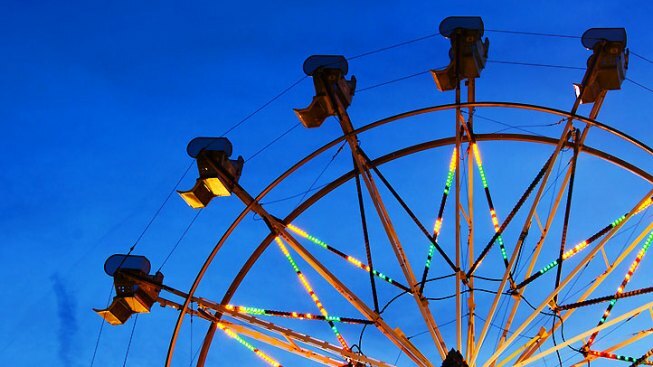 Virginia's largest fair features craft exhibits, animal and midway shows, a kids' fun zone (featuring a chain saw artist! ), pony rides, show barn performances and plenty more. Adults ages 14-59 are $10; kids 5-13 and seniors older than 60 get in for $5. Unlimited ride wristbands are $16 Monday, Wednesday and Thursday and $20 Saturday. Everyone admitted $5 Friday Aug 1; active duty military admitted free. Veterans free Sun., Aug. 11 for Veteran Appreciation Day. Buy tickets online here. Celebrate some of D.C.'s "home-grown" talent. Check out photography, plants and art by locals. The event will be held this year in conjunction with the Barracks Row Fall Festival.